The CW just released the first image of their Arrow/Flash universe spin-off DC's Legends of Tomorrow. Gathering up fan favorite heroes and villains from the two successful shows, and introducing a couple new super-friends, Legends will pit the team against an enemy that threatens time itself. Take a look at the team below! Remember in 2007, when Brandon Routh was our resident Superman? Well, he may no longer be the Man of Steel, but he got an upgrade as the Man of Dwarf Star Alloy, playing re-occuring character, Ray Palmer on Arrow. Palmer is a Tech genius and CEO of Palmer Technologies, who, after the death of his fiancée, builds his A.T.O.M. suit to protect the citizens of Starling City. He just gave his company to Arrow regular, Felicity Smoak, so he's now free to join the team, and be the most-likely candidate to lead. Leonard Snart is a professional thief, who stole a freeze gun from S.T.A.R. labs in an attempt to stop The Flash. After battling back and forth, the two entered a sort of stale-mate. Since Snart (Captain Cold), knows The Flash's secret identity, the speedy hero agreed to spare him from prison if the villain stops his criminal ways and keeps Barry's secrets. A pyromaniac and accomplice of Captain Cold, Mick Rory (Heat Wave) is covered with burns as a result of his crimes. The duo use their Fire and Ice guns to battle Flash throughout Season 1. Casting and reuniting the actors who starred in the hit Prison Break to play this hot and cold pair, is a nice touch. Sara Lance returned to Starling City as Canary, a mercenary trained by the League of Assassins, where she became a vigilante primarily helping women being attacked by men. Sara was killed aiding Arrow, and her sister, Laurel, took up her mantle, becoming Black Canary. It looks like through the use of time travel, Sara will return to her life of crime fighting, but take on the moniker White Canary, as a counterpoint to her sister's work in Arrow. Dr. Martin Stein was caught in the accident at S.T.A.R. labs, the particle accelerator fused he and engineer Ronnie Raymond. Together they form the meta-human Firestorm. Receiving help from The Flash and his team, Dr. Stein and Ronnie were separated, and developed a method of fusing together to become Firestorm at will. With Stein joining the Legends team without Ronnie, Firestorm may be out of commission, but the scientist's brilliant mind will definitely be able to help the team in the lab. Plus, Ronnie can always come visit in a crisis. A new character to the CW's DC universe, Rip Hunter is a time traveler, who after seeing horrible devastation in the future, begins assembling the team to stop it. Hiring a veteran Doctor Who actor like Arthur Darvill to play the time hopping rogue, was an obvious and brilliant choice. Another new character, Hawkgirl will be joining The Flash in his season finale next Tuesday. A classic DC character, often times appearing in the Justice League. Every time Hawkgirl dies, she is reborn in another young woman. Fans paying close attention to The Flash this year, knew she was coming a long time ago. 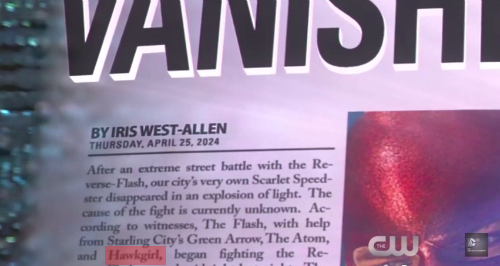 She's mentioned in the newspaper clipping Barry found from the year 2024. Franz Drameh as Unknown Hero! Not pictured above is actor Franz Demah, who was announced most recently as the newest cast member to join DC's Legends of Tomorrow. Little is known about who he's playing but fans are hoping for favorites like Static Shock or Black Lightning.